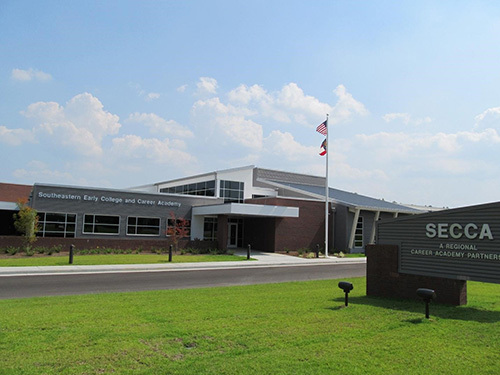 SECCA stands for Southeastern Early College and Career Academy. Organized as a charter school/regional career academy for high school students, SECCA is an educational partnership among four Georgia school systems (Montgomery County Schools, Toombs County Schools, Treutlen County Schools, and Vidalia City Schools) and Southeastern Technical College (STC). SECCA is the first charter school/regional career academy partnership in Georgia where students from more than one school district will attend classes together. What is the purpose of SECCA? By pooling our resources and working together for the common good of all students, SECCA partners increase academic and career/technical education course opportunities for high school students in the Toombs, Montgomery, and Treutlen County area. As a result, high school students who participate in SECCA classes can take high school and college courses that are directly relevant to their career and educational goals. The expansion of relevant educational opportunities for all students will have a positive impact on student achievement, graduation rates, career outcomes for students, and the overall economic development of our community. What are SECCA's performance-based charter goals? Who can participate in SECCA classes? Any 9th through 12th-grade student who is enrolled in one of the following area high schools can participate in SECCA classes. © 2018 - Southeastern Early College and Career Academy. All Rights Reserved. Website Design by J. Chris Brown Designs.